On Saturday, I joined millions of others who were watching the moving funeral service for John McCain at the National Cathedral in Washington. 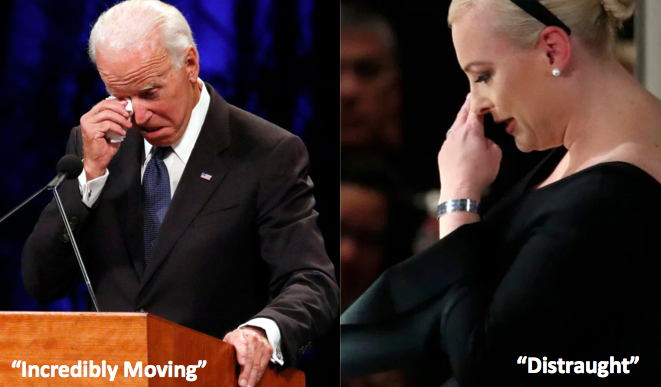 If I was taken by the pomp, I was awestruck by the eulogy given by his daughter, Meghan McCain. I sat, glued to my couch, sobbing and wiping my tears on my sleeves so that I wouldn’t miss a moment. As I watched, I imagined Ms. McCain’s father’s strength coming through the force, conviction, and decency in her words and her demeanor. To me, that speech was a beautiful example of the love she said her father represented to us. To me, “love” during the days after your father’s death looks like strength mixed with despair. The ability to stand firmly in front of millions who were watching there and on television and deliver that speech is the definition of authentic leadership. Ms. McCain’s eulogy was vulnerable, real, and authoritative. The most stinging and personal rebuke came from McCain’s distraught daughter, Meghan, who dispensed with diplomatic niceties and coded language to condemn the sitting president in a style as direct and raw as her father’s. The piece went on to regard Ms. McCain’s reference to America and greatness as fierce, but honestly, on first read, I didn’t get that far. I stopped reading at “distraught.” Distraught? The denotation feels fair, but the connotation offered in the second definition and in the Shakespeare quote makes clear that this adjective was a poor choice for this situation. Even if technically true — one tends to be distraught when one loses a loved one — there are 100 adjectives that would have more aptly described Meghan McCain’s speech in its proper current and historical context. “Impassioned,” “forceful,” “poignant,” “stirring” are a few nice examples. But it’s not just that this wasn’t the best descriptor; it was among the worst. When I read this, I felt a tiny pin prick of gendered language, and the reason I sat down to write about it is that these seemingly minor injuries add up. But there’s more here. Calling anyone who is emotionally honest and also extraordinarily effective “distraught” reinforces a horribly dated but still persistent belief that emotions aren’t acceptable on a public stage. That powerful leadership and emotions are mutually exclusive. This belief carries costs. We are people with thoughts and emotions, and if we want to show up fully as ourselves — something that I and my partners at MergeLane and Leadership Camp regard as critical to successful leadership — we need to be permitted to bring both to all aspects of our lives. More importantly, if we want to be serious about addressing rising suicide rates and issues of mental illness that affect people in business and in life, we need to give space for people to be vulnerable and to ask for emotional support without opprobrium. Now not every publication fell prey to this faux pas. Business Insider called Ms. McCain “emotional and fiery.” Time called her speech “tearful and deeply personal.” That’s terrific, but I want to catch this slight in a major, trusted news source. I want to highlight it. And, honestly, what I most want is for it to stop and for all of us to give men and women the green light we all need to be fully ourselves, on our best days and our worst days.